The gains in core-CPI inflation in January were impressive. Month-over-month inflation came in at an annualized of 4.27 percent, a rate unmatched since a 4.29 percent reading in March of 2005. Rising prices across a broad array of categories drove the gains, with apparel, transportation, used cars, and medical care services standing out among the major sectors. The breadth of the gains is at first glance somewhat disconcerting and suggestive that maybe the dam has broken. Perhaps it was premature to declare the Phillips curve dead. I think though it remains too early to make that call. First, some of the gains, such as apparel, are almost certainly not likely to be sustained. 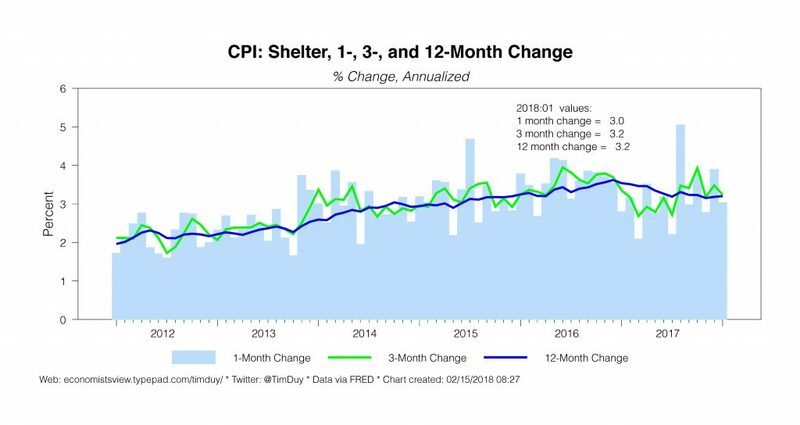 Second, note that a major component of CPI inflation, shelter, remains off its peak. Continued restrained housing costs will weigh down the overall measure. And third, there may be some lingering seasonality issues as play. In a low inflation environment, the number of times firms raise their prices falls, and the timing of the remaining increases may be concentrated around the December and January. Also, firms may have a tendency to raise prices along with minimum wage increases, also January. The Fed will of course be delighted that their forecast inflation rebound looks more likely to be true this year than last. But they will also be wary of reading too much into recent data. They have been fooled before; after such a long run of disappointing below-target inflation, they will not break out the champagne just yet. More data will be needed to raise the Fed’s confidence in the sustainability of inflation. At this point, the inflation numbers justify maintenance of their existing forecast. They do not, however, justify raising the forecast. 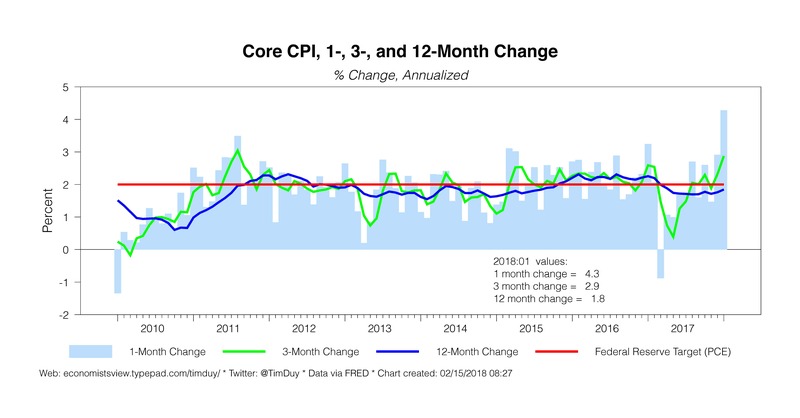 Assuming the Fed behaves like last year, they will not over-react to higher than expected inflation if they think it is transitory within the context of their forecast. Changing their rate hike plans requires that inflation will not revert to target over the projected medium-term policy conditions. It is too early to say that. With this in mind, beware of reading too much hawkish intent into the minutes of the January meeting. We don’t want to confuse increased confidence of a rate hike in March with an intention to change the pace of rate hikes. Moreover, note also the meeting preceded the recent volatility in financial markets. Any concerns over excessively easy financial conditions have likely moderated since then. The data flow last week included more than just CPI. 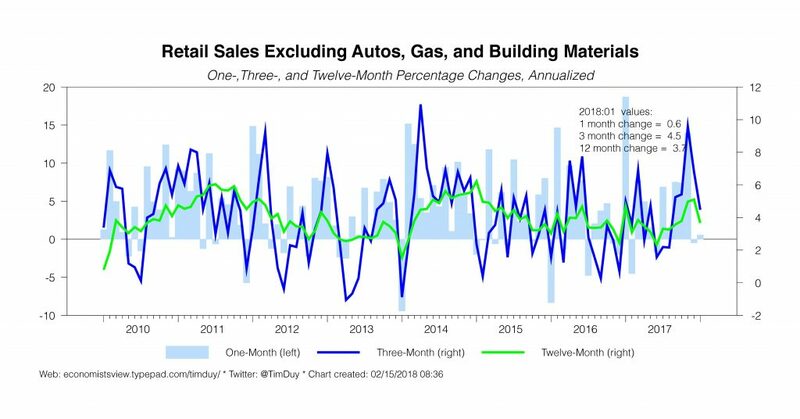 Weaker than expected retail sales data suggest that consumer spending momentum faded in December and January. Recall that the consumer boosted GDP growth in the final quarter of 2017; this could be an indication that this strength will not carry forward into 2018. Which means be cautious with any 2018 forecast inflated by activity in the latter months of last year. The Fed is looking for a healthy (by recent standards) 2.5 percent growth this year. They will need the consumer to cooperate to hit that mark. 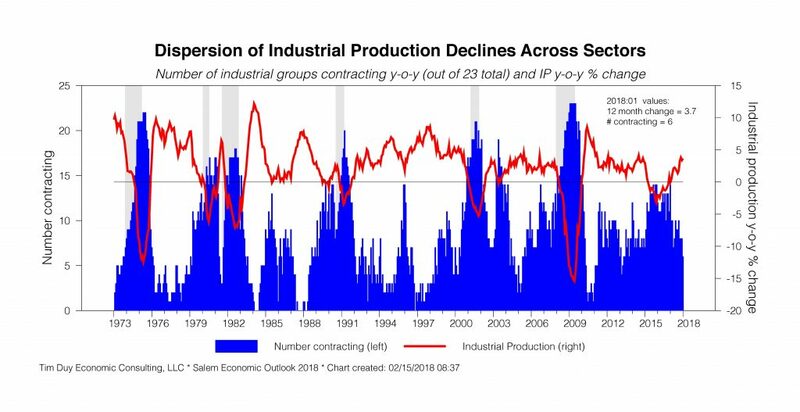 Industrial production fell 0.1 percent compared to December. The less volatile annual number has rebounded to the pace of activity experienced prior to the 2015 oil price shock. Given the strength and magnitude of the rebound, I would not be surprised if some of the cyclical momentum recedes in the coming months. Also watch the auto sector. Sales began moving sideways in late-2015 and were in a downtrend for much of last year. The sector was “saved” in some sense by hurricane damage sales, but that factor looks to be fading. Housing starts continued to grow throughout 2017. Multifamily held up better than I expected, which is good news for both sustaining aggregate demand and constraining shelter inflation. Single family continues to make ground, albeit still well below pre-bubble levels. 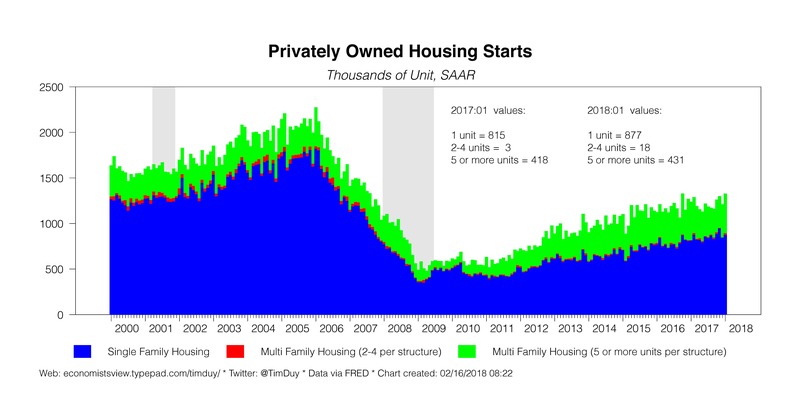 The ongoing aging of the millennial population should maintain upward pressure on single family construction even as multifamily activity levels off. How does fiscal stimulus fit into the picture? As is well known at this point, the US economy is about to run an experiment with a late cycle fiscal stimulus. 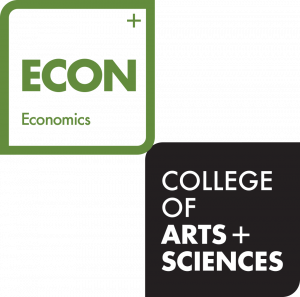 It is also widely believed that the US economy is already operating near full employment. It is also widely believed that the potential growth rate lies below expected growth for this year. And next year as well, even in the absence of the recent spending package. So arguably the stage is set for economic overheating by the middle of 2019 if not earlier. The primary concern is that when the Fed realizes the magnitude of the overheating, central bankers will quickly hike interest rates and trigger a recession. While there is some talk that this recession will come as early as 2019, that seems too early to me. Given the lags in monetary policy, I think the Fed would need to hike rates over 100 bp in the by the middle of this year to push the economy into a mid-2019 recession (and if that happened, this will be the best timed fiscal stimulus in history). In any event, you can find the worrisome story in many places, so I think maybe it is best for me to chart a less worrisome scenario. That scenario has four elements. The first is that the cyclical momentum of late last year will fade as the year progresses. Hence why comined with gradual tightening, the Fed’s 2019 forecast has growth slowing to 2.1 percent. Consequently, some of 2019’s fiscal boost is just offsetting that cyclical fade. Second, a substantial portion of the fiscal boost may be simply offshored in the form of a higher trade deficit. That relief valve helps prevent the US economy from overheating. Thus, while there might be a domestic demand boost, the stress on domestic capacity will be limited by the trade deficit expansion. Third, we don’t actually know how much capacity remains in the US labor market. Even a modest acceleration in wage growth might drive up labor force participation. Or increase labor saving investment, which would boost productivity. Either would raise potential growth. Finally, we are running this fiscal policy environment in a very different monetary policy environment than the 1980’s. Inflation expectations are low and well anchored. Moreover, those expectations are reinforced by an explicit inflation target. It may be that the Fed does not have to hike interest rates aggressively to keep a lid on inflation pressures. In other words, no sharp slowing of the economy required. Gradual rate hikes will do the trick – although those hikes will continue into 2020. Another possibility is that the persistent low interest rate environment signals that the US government should be running a higher structural budget deficit. This alleviates a global safe asset shortage driven by a surplus of global savings. Arguably, as the issuer of the global reserve currency, the US has a responsibility to creates these safe assets. And maybe that is what is necessary to “normalize” the term structure into a range that frees monetary policy from the zero bound problem. So maybe rates rise faster and or higher than expected, but in way that leaves the Fed simply chasing the long rate higher that returns policymakers to the more familiar, pre-Great Recession world. 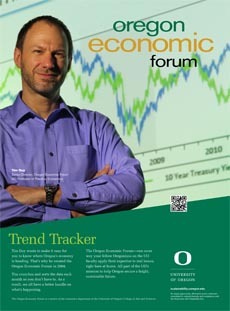 Bottom Line: There are many, many moving pieces as the economy moves deeper into the economic cycle. It is a complex environment made only more so by the fiscal stimulus barreling down on the economy. My general takeaways: 1.) The data flow is generally supportive of the Fed’s forecast, 2.) the risk is that the Fed moves at a faster than anticipated rate of hikes 3.) that said, the Fed will not overreact to any one data point 4.) the Fed will adjust policy as necessary to maintain the inflation target over the medium run, 5.) the current policy operating environment of low and anchored inflation expectations leaves open the possibility that the Fed does not need to choke off fiscal stimulus even if it threatens to overheat the economy, 6.) fiscal stimulus does not increase the risk of recession in 2019 as much as in subsequent years if it is revealed that the Fed fell behind the inflation curve, 7.) fiscal stimulus though makes the Fed’s 2019 and 2020 rate forecast more likely.